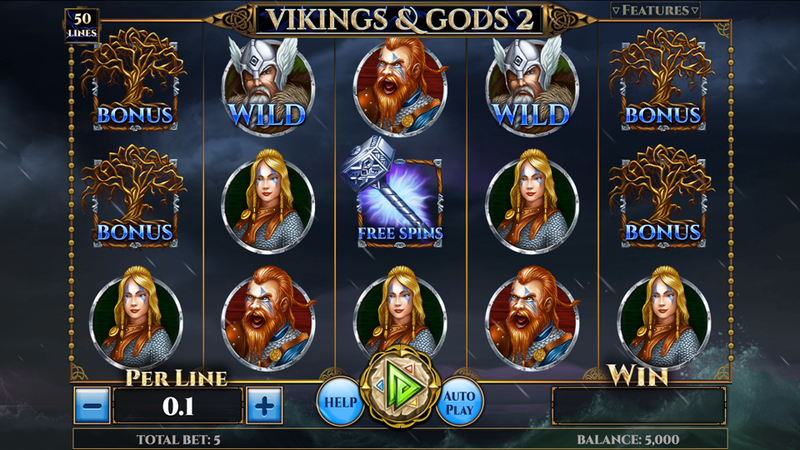 Sail to the heart of storm with Vikings & Gods 2, a Norse mythology-themed 5-reel 3-row 50-payline video slot machine released in spring 2019 by Spinomenal. Join the brave warriors on their quest to Valhalla and enjoy no less than 4 unique Bonus games, Shifting Reels, Extra Wilds, Scatters, Free Spins, and Multipliers. There is a maximum of 90.000 coins you can score when trigger the Epic Win, so find out more about this jackpot after reading the Vikings & Gods 2 slot review. We have no free play mode available yet, but take a look at the Vikings & Gods 2 screenshots instead. Or why not simply giving a try with one of the recommended casino sites above? In terms of the gameplay, this is a classic video slot machine asking for prospective winners to line up 3 or more matching symbols on adjacent payline. The coin value goes from €0.01 to €10, so you can wager between €0.50 and €500 per round, according to your ambitions and experience. Newbies are always suggested to try the Vikings & Gods 2 Free Play and learn how to win by investing demo credits instead of real money. Remember the set of rules remains the same whether you play for fun or for cash. Fearless Vikings dominate the paytable, where each symbol has its distinctive payout rating. For example, 3, 4 or 5 female warriors pay 60, 160, or 200 coins, respectively. Her male companion is the second-best choice granting 50, 140 or 180 coins for the same number of active symbols. You will also find stylized playing cards from Tens to Aces granting 5 to 100 coins for combinations of 3 to 5. Acting as the Wild, the chieftain replaces all other symbols but the Scatter. Moreover, thanks to the Extra Wilds feature, you can receive 4 to 12 Wilds dispersed throughout the base at any random occasion. Another way to boost your bankroll is courtesy of the Win Multiplier that also comes out randomly and improves the winning line 2x, 3x, 4x, or 5x. The Vikings & Gods 2 Bonus takes you on a memorable journey through the Nordic mythology, so click the compass to start exploring Asgard, Hellheim, Muspelheim, or Niflheim. Each scenery lets you pick 4 out of 7 ice balls to reveal the cash prize. When 3 Thor Hammer Scatters land anywhere on the reels, you will activate the Vikings & Gods 2 Free Spins feature and claim 10 rounds at the casino’s expense. Any winning combination triggers the re-spin feature moving all rows down by 1 and revealing a new row on the top. You can play online on various mobile-friendly sites powered by Spinomenal, which doesn’t require any app to download on your Android or iPhone. 3. What is the RTP factor of Vikings & Gods 2? According to the official info, the RTP stands at 95.13%. Our Vikings & Gods 2 recension proved this figure to be correct. Offering a glimpse to the lifestyle of gods and their most loyal subject occupying north seas and lands, this is a bit harder game and recommended to more experienced players. You can surely try our Vikings & Gods 2 tips and see how much will they help you on the road to the massive life-changing jackpot prize.